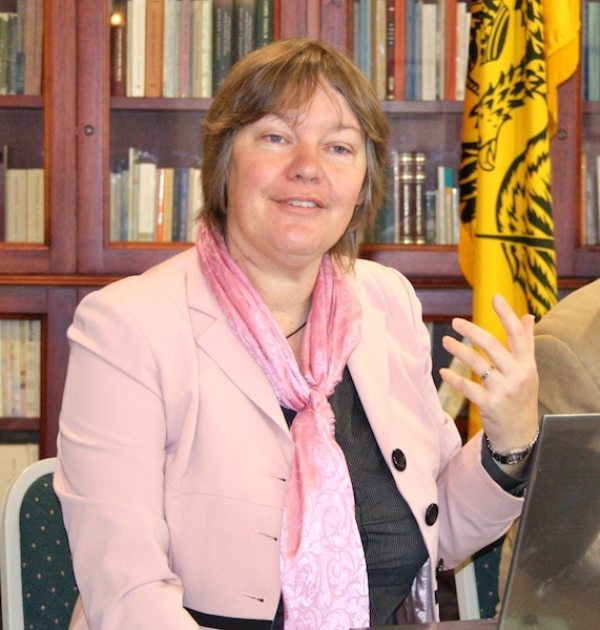 Dr Bronwen Neil FAHA is Burke Senior Lecturer at the Australian Catholic University (QLD) and is the co-editor of the Oxford Handbook to Maximus the Confessor. 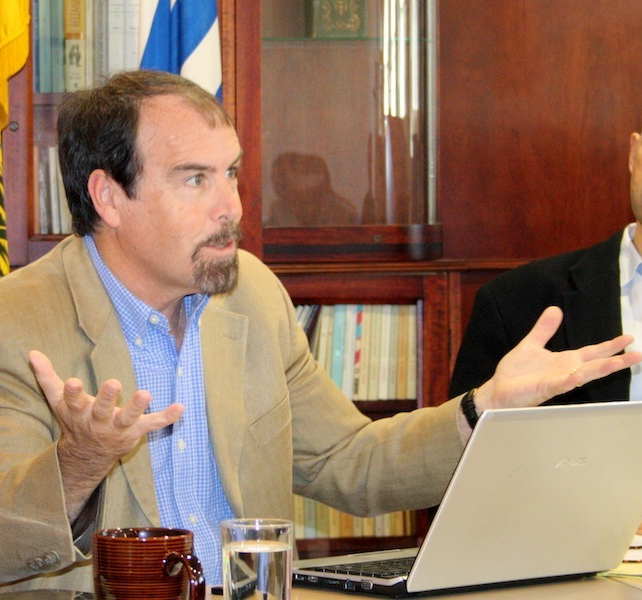 Professor Paul M. Blowers is the Dean E. Walker Professor of Church History at Emmanuel Christian Seminary, Tennessee (USA). 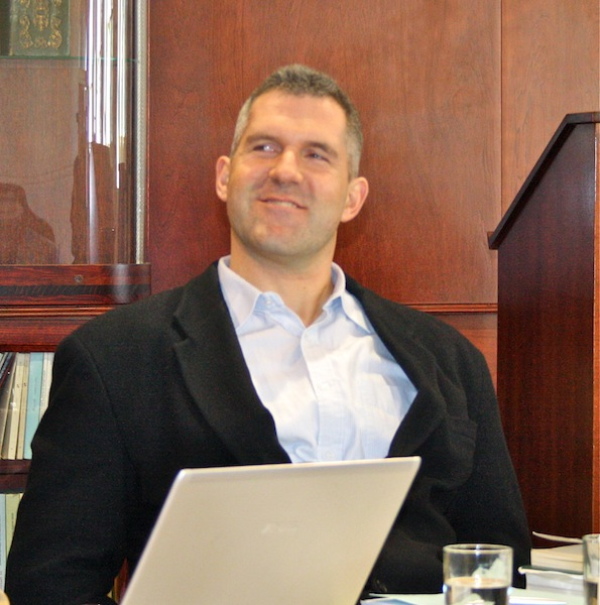 Dr Adam Cooper is Senior Lecturer at John Paul II Institute for Marriage and Family, Melbourne (VIC). 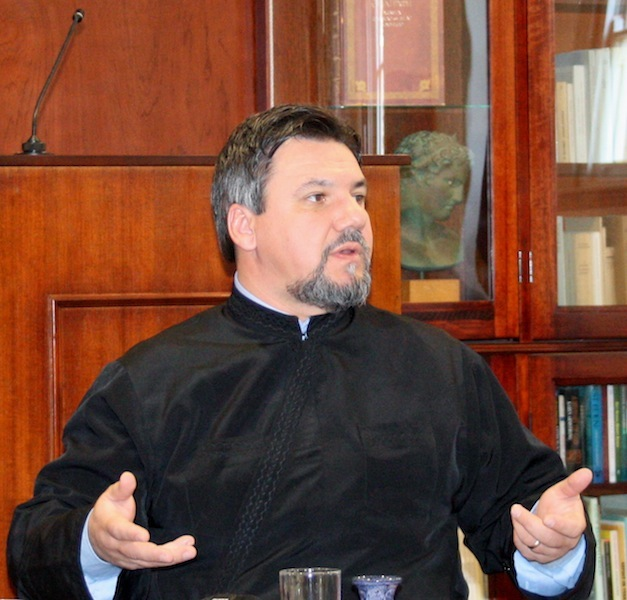 The Very Revd Dr Doru Costache is Senior Lecturer in Patristic Studies at St Andrew's and organiser of this Round Table. From L to R: Dr Bronwen Neil FAHA, Professor Paul M. Blowers, and Dr Adam Cooper. 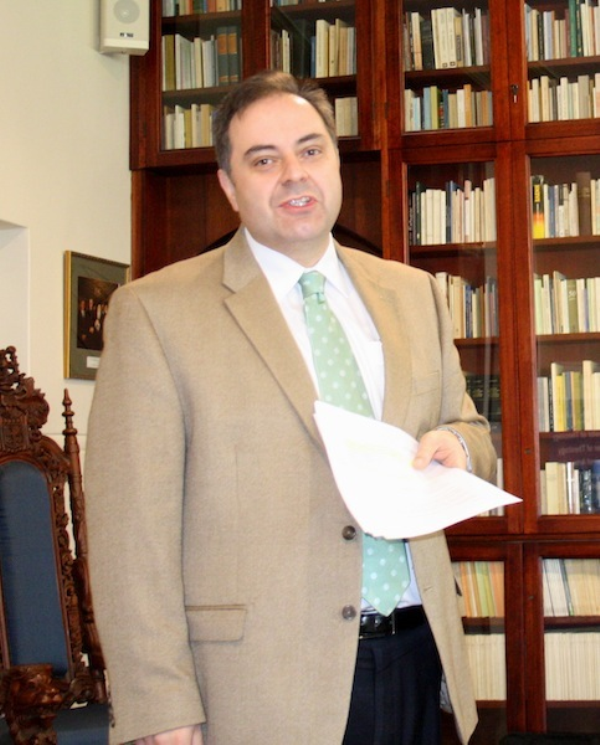 Dr Philip Kariatlis is Senior Lecturer in Theology and Academic Director of St Andrew's - Moderator of the Round Table. 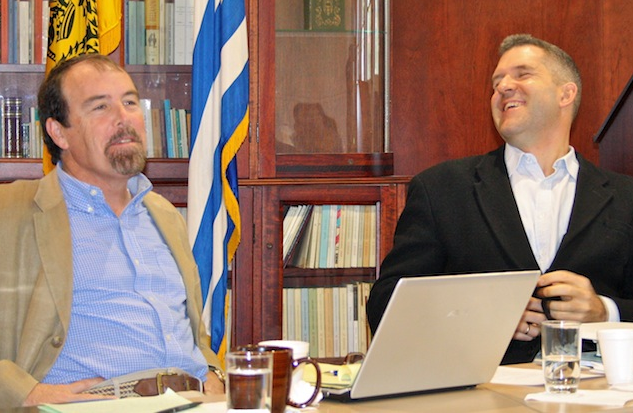 Professor Paul M. Blowers and Dr Adam Cooper in dialogue. 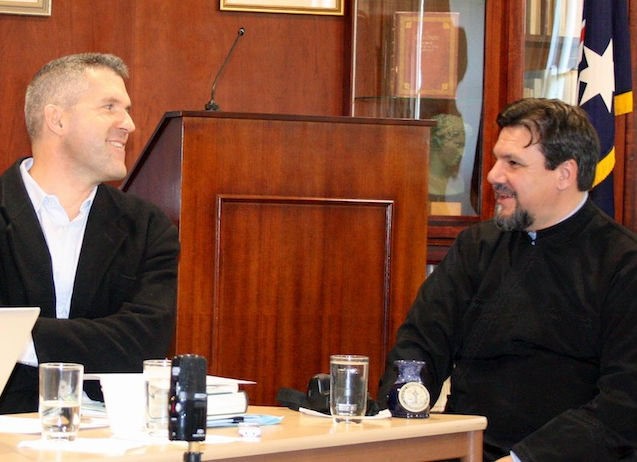 Dr Adam Cooper and the Very Revd Dr Doru Costache. 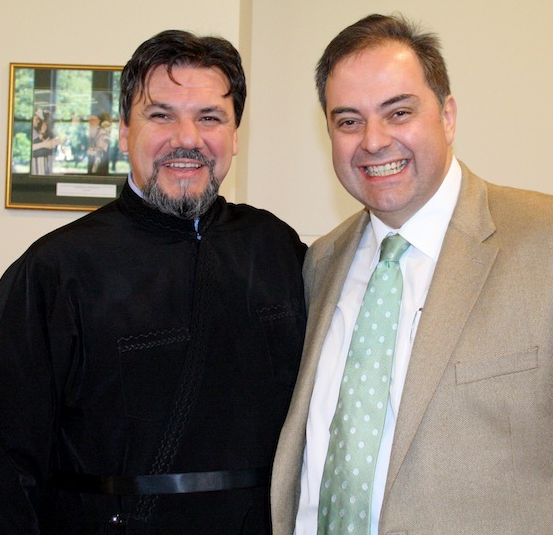 The Very Revd Dr Doru Costache and Dr Philip Kariatlis. 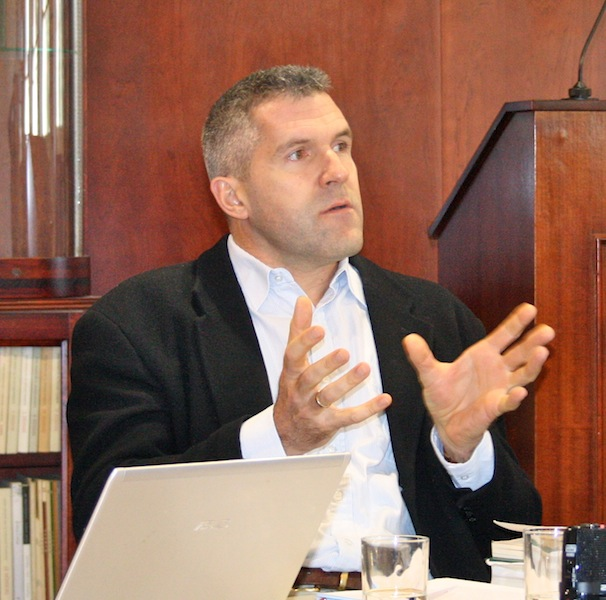 On the 27/07/2013, St Andrew's held a Round Table discussion on St Maximus the Confessor. 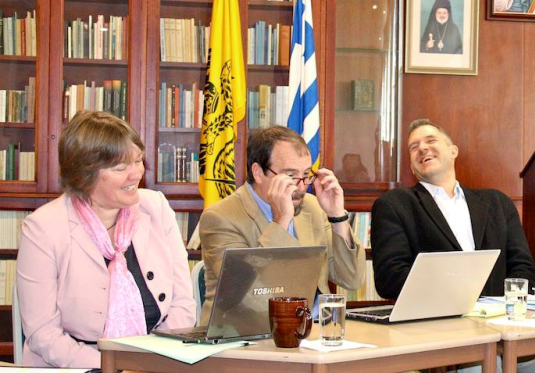 Moderated by Dr Philip Kariatlis, the discussion featured eminent Maximian scholars Dr Bronwen Neil FAHA (ACU, QLD), Professor Paul M. Blowers (Emmanuel Christian Seminary, Tennessee, USA), Dr Adam Cooper (JP II Institute, VIC), and the Very Revd Dr Doru Costache, all of whom are contributing chapters to the forthcoming Oxford Handbook to Maximus the Confessor, edited by Dr Neil and Professor Pauline Allen FAHA (ACU, QLD). The event began with Dr Neil giving a brief introduction to the Handbook, followed by fifteen minute presentations by each of the participants which focused on the nature of their contributions to the Handbook and other related Maximian themes. After a short coffee break, a dialogue was commenced between Professor Blowers and Dr Cooper, both of whom commented on each other's respective presentations. Finally, the panel addressed questions from the audience.